Right about this time, AMD should be feeling bullish about its 2018 chances in the CPU market. Not only has the company teamed up with Intel to launch the first ever Intel CPUs with its Vega GPU integrated, AMD also announced Ryzen 3 Mobile and Ryzen 2 CPU platform for desktops and high-end systems. AMD released the first round of high-end mobile Ryzen processors for notebooks last year, and the reviews so far indicate fantastic performance in that category. And now at CES 2018, AMD is expanding its line-up with APU chips designed for affordable laptops and Chromebooks. AMD’s APUs have been something fans have been craving for ever since Ryzen threw open the competition to Intel early last year. First up in the 2018 mobile line-up, is the Ryzen 3 2300U, which AMD says is targeted at the budget segment. Even so, it promises a lot of oomph thanks to the full-feature nature, 4 cores and 4 threads clocked at a base 2.0GHz and boost 3.4GHz. As it is an APU, AMD has added full-on Radeon RX Vega graphics powered by six compute units. Lower down the tier is the dual-core Ryzen 3 2200U, which has AMD’s version of hyper-threading to have 4 threads at standard 2.5GHz frequency, with a max boost of up to 3.4GHz. This one will also feature Radeon RX Vega graphics, but only three compute units to power it, which should be a good boost for productivity machines. 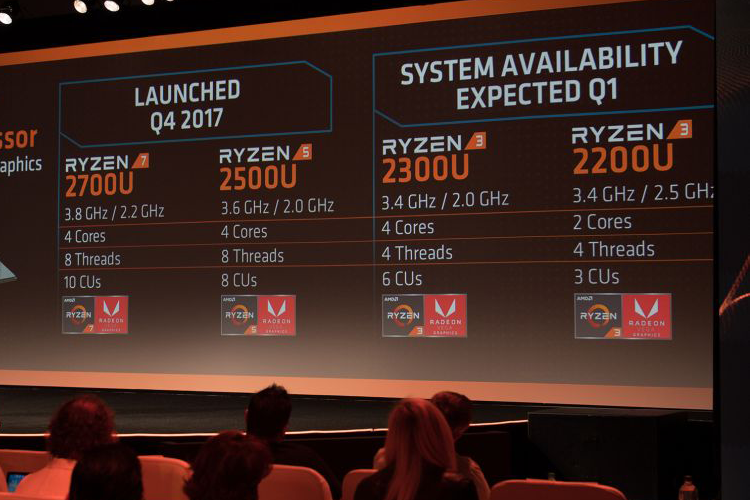 AMD says its Ryzen 3 Mobile APUs will be out in select markets this quarter, and manufacturers are currently displaying machines powered by these at CES 2018. Stay tuned for more on which laptops from CES 2018, that will feature the new APUs as well as other computing announcements from the year’s biggest electronic show.